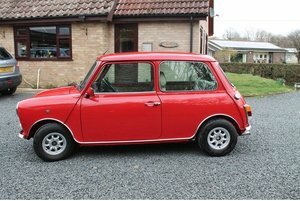 ** Reduced Price ** H824PPW: Flame Red 998cc with the rare John Cooper twin-carb conversion, fitted when new. 68,500 miles. Fresh MoT (expires 6th Dec 2019). 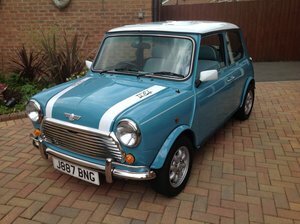 The Cooper conversion from 1990 (the one they sent out as a boxed-kit to Japan which led to the rebirth of Cooper 'S' in '96) includes twin SU carbs, modified manifold, a modified head and Cooper 'S' graphics. A similar kit is offered by the Cooper Car Company today for £2774 although that includes a roller-bearing rocker set where the one fitted in 1990 does not. Interior Cooper mod's include a genuine John Cooper Moto Lita steering wheel, John Cooper alloy pedal set and alloy gear knob. 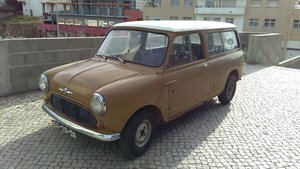 This car is fresh from a visit to Southam Mini & Metro Centre, who refitted the head that I had refurbished (bead-blast, new bronze valve guides, valves refaced, valve seats recut, head refaced) last year at Rob Walker Engineering, set it up on the rolling road, fitted a new clutch, discs and pads, and MoTd it. . Professionally refurbished cylinder head . New clutch . New wheels and tyres . New drums . New vented discs and pads . New adjustable HiLos . New battery . New water pump . New genuine Rover door glass both sides The previous owner did some renovations and modifications in late 2014 (1000 miles ago): had a new wing fitted, new door skins put on, and had the whole car repainted, the white roof painted black and black bonnet stripes fitted, and he put new wheels (165x60 R12 JBW Superlights - black with red pinstripe and Cooper badges), Falken tyres and wheel-arch extensions on. I bought the car in early 2015 and have driven less than 1000 miles in it because babies came along and took all my time up. It has always been stored in my warm dry garage and just used occasionally. I have a folder of documentation with MoTs and receipts dating from 1997 onwards, and documentation from the DVLA of the previous owners, so the low mileage is verifiable. The documentation includes the original receipt from John Cooper Garages for the engine conversion, fitted by the supplying dealer - Mann Egerton in Norwich. 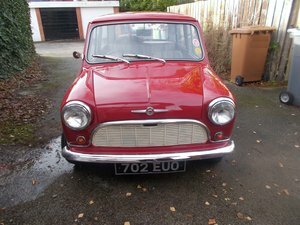 Overall this car is in excellent condition with some rare and pricey Cooper mod's and additions on it. The engine and chassis numbers match the V5. More photos available.